No sooner do I conceive of the One than I am illumined by the Splendor of the Three; no sooner do I distinguish Them than I am carried back to the One. When I think of any One of the Three I think of Him as the Whole, and my eyes are filled, and the greater part of what I am thinking of escapes me. I cannot grasp the greatness of That One so as to attribute a greater greatness to the Rest. 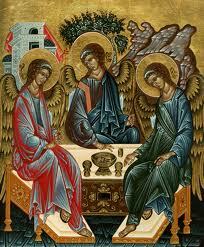 When I contemplate the Three together, I see but one torch, and cannot divide or measure out the Undivided Light. I’m trying imagine preaching a sermon like this and finding anybody still in the room at the end of it, though. . .
I’ve thought the same thing Jennifer. How do we teach and preach beauty that is more than what we see? The Great Mystery so eloquently described, but not with explanation: Only with Love and Adoration. Yes, Katie, I agree. God can be experienced but not explained. Too many words sometimes ruin the experience.